Join a gay sail around Puerto Rico and its surrounding islands. We’ll explore the gay nightlife of the capital, San Juan, and visit some of the best islands in the Caribbean. The calm seas will make this a relaxed journey. We’ll be stopping at some secluded spots where all you’ll see is sun and sea for miles. This is the largest marina in the Caribbean. We’ll board at 5:30 pm, have a welcome drink, do our first nautical briefing and then go for dinner. Our journey begins in the Spanish Virgin Islands. We’ll sail to Isla Palominos off the east coast of Puerto Rico. This small island offers perfect beaches and a sense of untainted paradise. Today we’ll visit an uninhabited wildlife refuge in Culebritas. We can take a hike to the lighthouse and explore the idyllic Tortuga Beach. We’ll then head back to the southeast coast and anchor in Bahia de Almodovar. This morning we’ll head to Flamenco Beach, one of the best beaches on the planet. We’ll sail northwest to Culebra and anchor at Playa Tamarindo. Today we’ll sail to Vieques, the largest of the Spanish Virgin Islands. 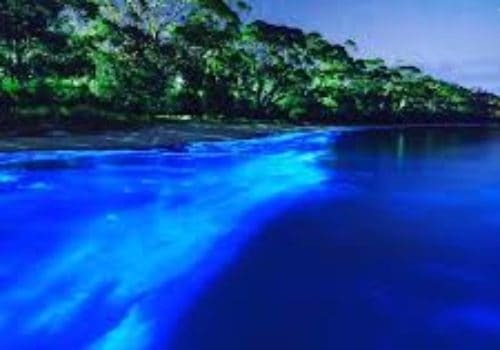 This is the Mosquito Bay, so bioluminescent it’s known as the brightest bay in the world. Sailing east we’ll arrive at Vieques’s Ensenada Honda. Explore the secluded mangroves before we head to Ensenada Honda and stop at Le Chiva beach. We’ll head back to the south side of Vieques, exploring some beaches and coves on the way, and stop at Green Beach. Here you’ll watch the sunset on your last night in the Caribbean.